"Thank you. I've had an incredible time living @ Milward Crescent, the house is beautiful. " "Beautiful and spacious house situated on a secluded crescent, halfway up the West Hill. The perfect, peaceful location with only a short walk to the Old Town, seafront and just about anywhere else you’d want or need to get to in Hastings. I have had a great experience living with pleasant and accommodating housemates, who have become good friends and really made living in a shared house like a home. 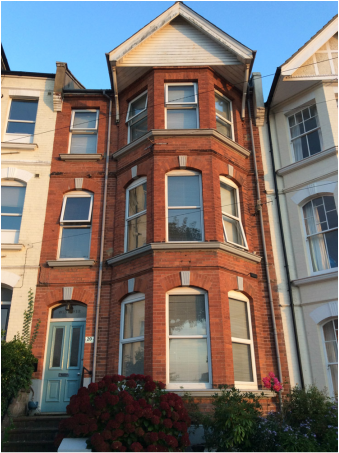 After being in Hastings for five years now, Milward Crescent has been by far the loveliest and most convenient place to live." "...If you have never been to Hastings you’re in for a refreshing treat. The air is clear and seeing the coastline every morning is surely something I will miss. 20 Milward Crescent is a spacious home, with great sized rooms..... Living room space is welcoming and when the weather is nice, plenty of outdoor seating areas to reflect or eat. At the end of the day it’s about who you live with and during my time there everyone was extremely friendly and welcoming, and I felt a great deal of trust." "I've loved my time at Milward Crescent. The house is tucked away up a street you'd have no reason to go up unless you lived there, so it was always peaceful. Andrew puts his focus on ensuring everyone's time here is a pleasant one, so everyone in the house has a good laugh and gets on. We'd often cook huge meals together and then head off to The Crown and they were some of my favourite nights. With that said, everyone still does their own thing too - the best of both worlds."